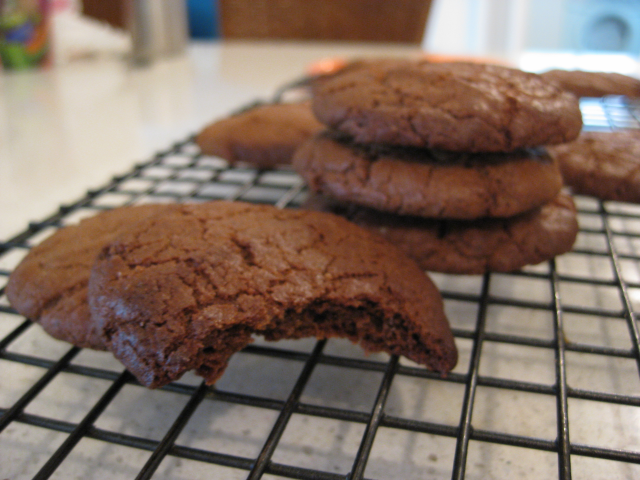 These cookies have a great crunchy texture, and can be made egg free if you like. The chocolate ones rock. The carob-vanilla are even better. ½ egg or 1 egg yolk OR about 1 tblspn of water if you want them to be egg free. I usually make them egg-free. 1 ¼ cup grain free flour mix – I use ¾ cup quinoa and the rest arrowroot or sometimes equal parts quinoa, buckwheat and arrowroot. ADD 1 tsp vanilla and 1/2 cup chopped nuts of choice. Hazelnuts are great! ADD 1 tsp vanilla and 2 tablespoons carob powder. Cream butter with brown sugar. Add egg or water and continue to cream mixture. Sift dry ingredients together and add. Stir until mixture well blended and “cookie dough” consistency. If too sticky, add a little more quinoa flour until right consistency. Take teaspoons of mix and roll and place onto baking tray. Lightly flatten. Bake 8 minutes for crunchy. A little less for more chewy. Leave to cool on tray for only a couple of minutes before placing on racks. 1 tblspns cocoa for chocolate biscuits or half usual amount of other spices.